Want to buy the number 8? Someone is promoting the sale of a Chinese domain name, shown here. 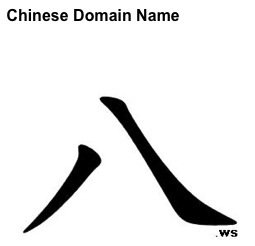 Technically, this domain is represented over the Internet as http://www.xn--45q.ws, which is the ASCII equivalent of the Chinese character — the DNS is still ASCII-only. In China, the number 8 one of the best numbers to have on your license plate, phone number, etc — because of the way it’s pronounced. But this particular domain is attached to the .WS ccTLD, which is Western Samoa. As ccTLDs go, .WS is not exactly up there with .COM or .CN. So maybe that’s why the owner is promoting it so heavily — I came across this sale via a press release. Why Pay for Translation if You Can Get it for Free?